The solid state drive revolution is in full effect for home consumers. Whether you have a laptop or desktop, you should no longer have a mechanical hard drive -- especially for running your operating system. SSDs are more affordable than ever, plus, insanely fast too. With so many SATA solid state drives on the market with similar specifications, how does a company make its offering stand out? RGB lights, of course! Yes, today, Hyperx launches the FURY RGB SSD with customizable lighting. In addition to this beautiful internal drive, the company is also launching an external model -- the SAVAGE EXO SSD. "The FURY RGB SSD offers an enhanced visual experience for gaming, overclocking PCs, and DIY system builds with up to 550MB/s read and 480MB/s write speeds and a visually stunning lightbar that offers dynamic, customizable RGB lighting effects. Compatible with RGB motherboards that support RGB lighting and multiple RGB devices, FURY RGB SSD can also be daisy chained to sync RGB effects across system internals. FURY RGB SSD is available in 240GB, 480GB, and 960GB capacities," says HyperX. Speaking on the external offering, the Kingston subsidiary says, "The SAVAGE EXO SSD is the ideal storage for users looking for fast, external storage for game backups, video editing and other speed sensitive storage requirements. The SAVAGE EXO SSD features read speeds of 500MB/s and write speeds of 400MB/s, and offers simple connectivity for Windows and Mac, as well as compatibility with XBOX One and PS4 via USB 3.1 Gen 2. SAVAGE EXO SSD weighs 56 grams offering a slim and compact design for maximum portability making it is the perfect solution for quick storage and data transfer on the go. It offers a load time increase of up to 20 percent on today’s consoles. It is available in 480GB and 960GB capacities." 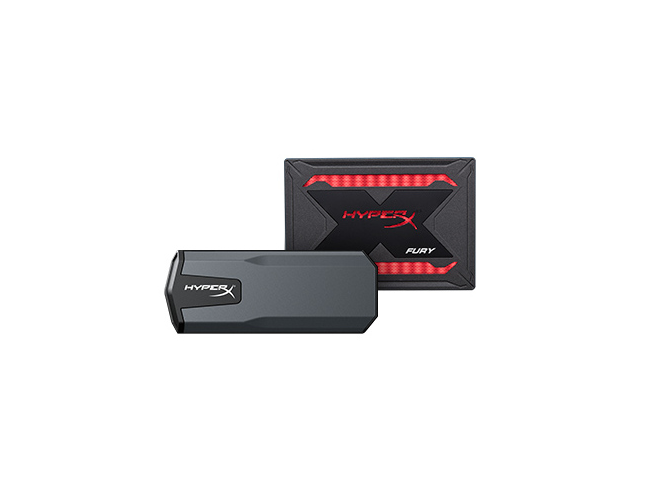 HyperX shares specifications for both drives below. The Fury RGB SSD can be had immediately from Amazon here starting at $74.99 for the base 240GB model. The Savage Exo is available from HyperX directly here beginning at $219 for the 480GB variant.